If you’re experiencing conflict in the workplace because of miscommunication, then OASIS Conversations may just be the book you need to make peace and move everyone forward beyond the communication barriers. But what if you’re having a conflict not in the workplace but in communicating with your spouse, your parent, your child, your sibling, your hairdresser, your doctor, or any other human being on the planet? Does the mere thought of trying to talk to certain people make your blood boil? Then the secret of how to have OASIS Conversations will benefit you as well. Author Ann Van Eron, Ph.D., understands the frustration of miscommunication, and she has developed a means to overcome it. 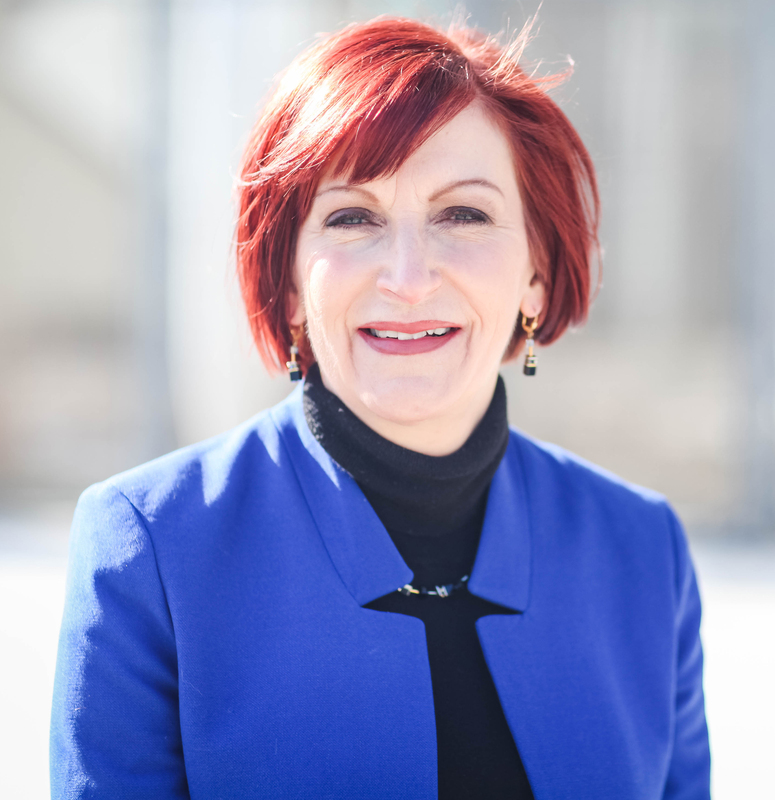 As the founder and principal of Potentials, a global coaching and organization development consulting firm, Van Eron has coached business leaders and their teams in how to create positive environments for over twenty-five years. She knows that only when people have open-minded conversations can there be positive and productive results. And her advice can be applied not only to the workplace but also to the home and everyone you need to communicate with. The idea behind having OASIS Conversations is actually quite simple. 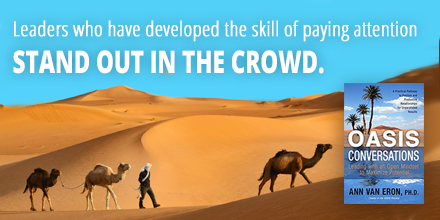 Imagine yourself in a desert, where you are hot, thirsty, and probably also feeling cranky and desperate. Then you see an oasis and experience instant relief. OASIS Conversations can do the same thing for you in your relationships. 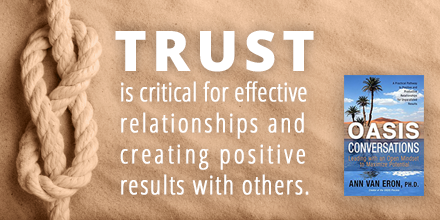 It will bring you and the person you need to communicate with or with whom you need to resolve conflict to a place of agreement and understanding. 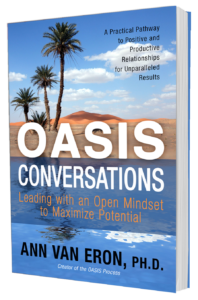 In this book, Van Eron shares her tried-and-true five-step process for creating OASIS Conversations. The process follows the OASIS acronym that defines five key words, one for each of the steps: Observation, Awareness (of assumptions, emotions, and background), Shift (to being open), Importance, and Solution. Van Eron spends one or more chapters on each of the steps so readers can absorb this simple and memorable process. Besides explaining the process, Van Eron offers numerous scenarios and examples to illustrate each step. Many of these are in the shape of dialogues and then Van Eron analyzes what was said and how it could be said better so that conflict can be turned into an oasis where open communication can flourish. I found many of the scenarios Van Eron presents to be relatable. For example, I once had a coworker yell at me for interrupting her train of thought just because I had said “Hello” to her when I entered the office. Van Eron looks at this type of situation from the expectations of various people in the workplace and whether or not they want to be greeted and why they would hold such a preference. Rather than telling us what are right or wrong responses, she asks us to put ourselves in others’ shoes and be open to understanding where they are coming from. She also talks about issues like “respect” and shows how the definition of what constitutes respect varies among individuals. Throughout, Van Eron draws on scientific brain research, including emotional intelligence, to justify her methods and explain why people react and respond the way they do to certain scenarios. She also draws on years of personal and professional experiences so that this book is far less about theory and more of a hands-on methodology to help readers achieve their communication goals. Personally, I thought Van Eron’s style was engaging and insightful. I kept feeling like little lightbulbs were going off in my head as I read her ideas and saw how rephrasing certain ways of speaking could make a huge difference in communication. There was also plenty of humor in some of the scenarios so that my attention never drifted. There’s always a better way of doing things, and communicating with our fellow human beings in a better way should always be at the top of our to-do improvement list. By reading this book, you will increase your emotional intelligence IQ, become a peacemaker, and learn leadership skills to help others move past difficult situations. All it takes is an open mindset and a willingness to learn the OASIS five-step method; then you’ll be on the path to knowing that a happier way of living is not just a mirage. Chicago, IL Oct. 24, 2016— Political polarization of historic proportions, volatile markets, a surge in racial violence—the world is uncertain these days. From the dinner table to the office to the streets, closed-mindedness and miscommunication are at the heart of this uncertainty—doing damage to relationships, bottom lines and lives. But a new book released today holds the key to eliminating these misunderstandings –in all facets of society. 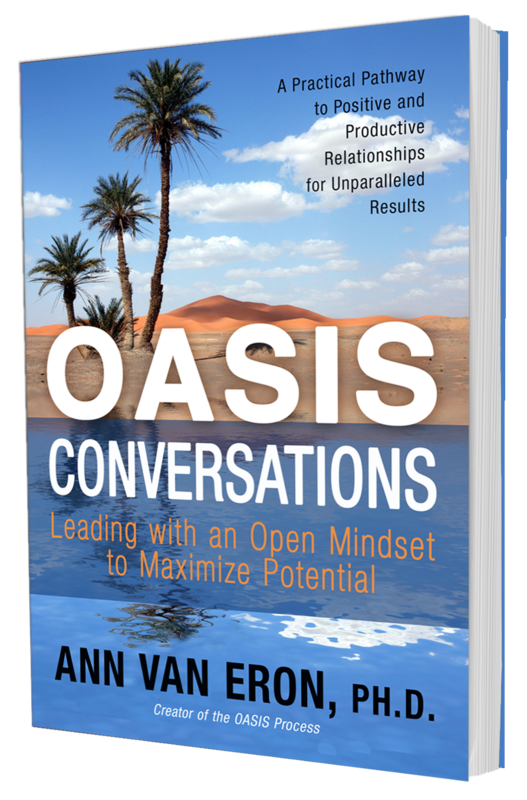 OASIS Conversations: Leading with an Open Mindset to Maximize Potential by psychologist, master coach, and top business consultant Ann Van Eron teaches readers, including business leaders, in simple and memorable terms how to replace misunderstandings with refreshing conversations. The method has already improved innovations and functions at places like the UN and GE Capital. The book is available on Amazon in paperback and Kindle editions. 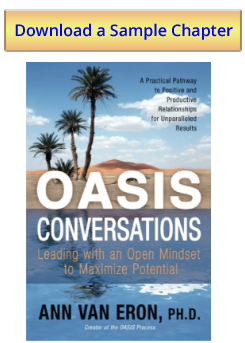 Van Eron, the founder and principal of Potentials, a global coaching and organization development consulting firm, draws on more than twenty-five years of coaching experience and scientific brain research to teach readers a simple five-step process for mind-opening connections with others, called OASIS. Leaders within global organizations and Fortune 500 corporations such as the UN, the World Bank, GE Capital, and New York Presbyterian Hospital have seen the OASIS method improve innovation, efficiency, problem-solving, engagement, and relationships. The OASIS method aims to turn the desert of miscommunication that exists into an oasis where people can have refreshing conversations. It is an acronym for the five steps or moves: Observation, Awareness, Shift, Importance, and Solution. Solutions together, such as changing the time of the meeting. The book includes numerous scenarios and examples to illustrate each step, along with practice sections reinforcing lessons from each chapter. It provides a memorable process for how to interact with someone who has a different perspective (everyone). The key is adapting an open mindset and shifting from judgment to compassionate curiosity, thus opening minds for positive and productive relationships. 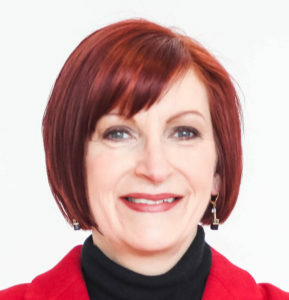 Ann Van Eron, Ph.D., MCC, is founder and principal of Potentials, a global coaching and organization development consulting firm, with experience in coaching leaders and teams all over the world for over twenty-five years. She draws on scientific brain research, including emotional intelligence, to justify her methods and explain why people react and respond the way they do to certain scenarios. She also draws on years of personal and professional experiences. She is certified as a Master Coach and has a doctorate in Organization Psychology from Columbia University. For more information about Ann’s work and book, visit about www.Potentials.com.